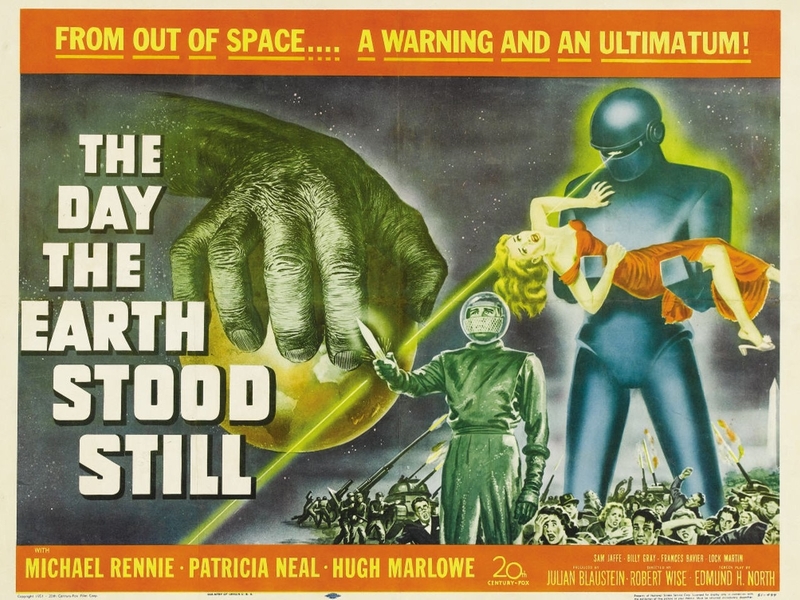 In our previous installments, we looked at how the 1949 science fiction short story, "The Outer Limit" by Graham Doar influenced ufology, and in the finale, we look at its impact on popular culture via entertainment, chiefly motion pictures. 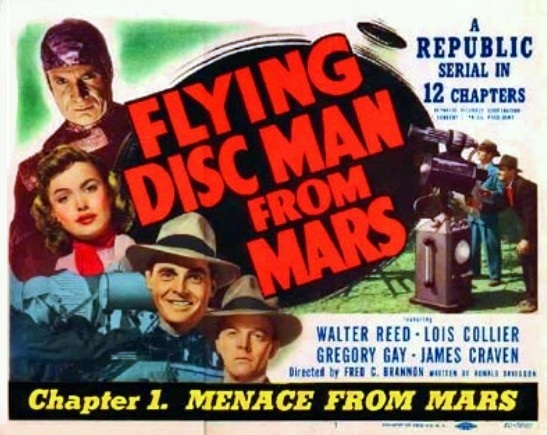 Flying Disc Man from Mars is worth a mention, even though it's probably not derived from Doar's story. 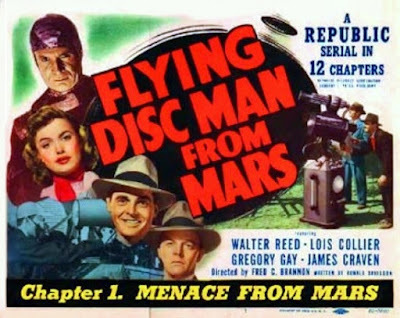 It is a movie serial from Republic recycling Martian invaders, but it's the first film to connect them to flying saucers, and more importantly for our study, atomic weapons. The invader Mota from Mars is spying on our atomic developments, is shot down and his saucer crashes. "...Mota reveals his objectives: it seems that Mars, disturbed by Earth’s discovery of the atomic power that Mars has possessed for over a century, is determined to make sure that the upstart Earthlings do not endanger the rest of the solar system with their newfound knowledge." From the summary of Flying Disc Man from Mars by Jerry Blake. The idea of the Earth's nuclear weapons posing a threat to the universe was catching on. Fawcett Comics (publisher of Captain Marvel Adventures) in Don Winslow of The Navy #66, March 1951, presented, "The Great Solar Mystery." 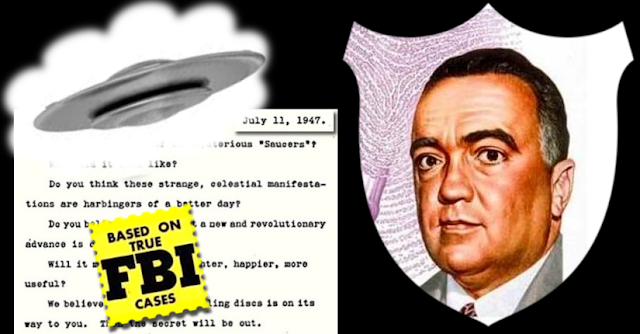 The US has built a saucer of their own to investigate the UFO mystery. Flying it to the planet Venus, Don Winslow discovers an ancient advanced civilization there. Once again, as in Doar's story, space pacifists are willing to destroy the Earth. The leader of the council explains, "You are working now on the Hydrogen bomb! If you detonate that-- the explosive chain might destroy the universe!" 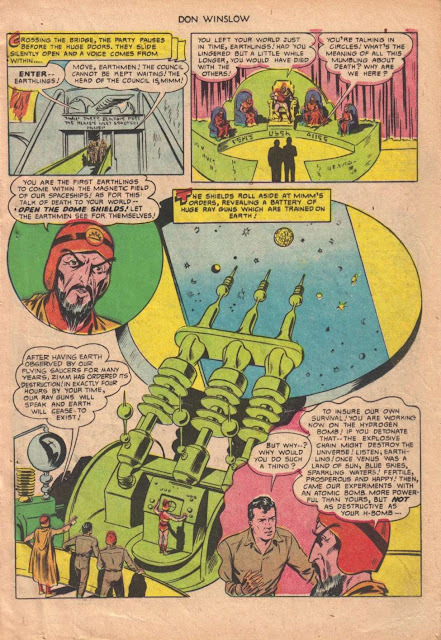 In this case, they were executing Earth without notice, but in the end, Winslow persuades them not to murder us by promising he'll alert Earth to the dangers of the bomb. The story is told from the point of view of reporter Cliff Sutherland. A strange ovoid ship travels through space and time to suddenly appear on the grounds near the Capitol in Washington, DC. "It was immediately apparent to all the assembled thousands that the stranger was friendly. The first thing he did was to raise his right arm high in the universal gesture of peace; but it was not that which impressed those nearest so much as the expression on his face, which radiated kindness, wisdom, the purest nobility. In his delicately tinted robe he looked like a benign god." His companion is a giant man-shaped robot mad of green metal. 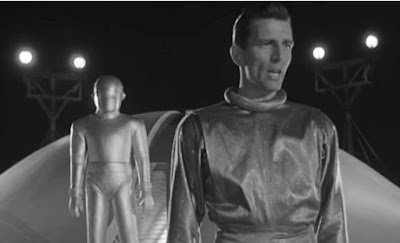 "I am Klaatu, and this is Gnut." He gets out one sentence before being shot dead by a deranged man who thought "the devil had come to kill everyone on Earth." After the tragic incident the robot is motionless and the authorities build a mausoleum for Klaatu and extended a wing from the museum to house Gnut and the ship. Sutherland discovers that Gnut is not inactive, but moves unobserved by night, but his actions are unfathomable. Eventually Sutherland sees that Gnut has managed to make a copy of Klaatu using a an imperfect recording, but he dies. Sutherland retrieves a recording in the hopes it will allow Gnut to create a permanent copy of copy of Klaatu. Gnut takes the recording but somberly, but delivers the line that provides the story's surprise ending. The message of the story seems to be that we are not the ultimate form of life or civilization- or something. An interesting bit of saucer trivia: In the original story, Klaatu's spaceship is not a flying, nor a saucer. It's perhaps more egg-shaped, we only have a mention of "the ship's curving ovoid surface." Maybe it's more of a time machine, or a time-space ship, since it's never seen flying. "On the area just to your right, just as it is now, appeared the time-space traveler. It appeared in the blink of an eye. It did not come down from the sky; dozens of witnesses swear to that; it just appeared. One moment it was not here, the next it was." When Hollywood got a hold of it, they'd make it a flying saucer. 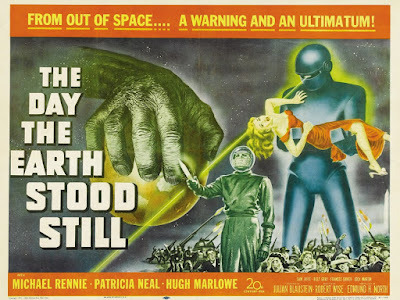 The Day the Earth Stood Still was released Sept. 1951 from 20th Century Fox. The screenplay was based on "Farewell to the Master," but Edmund H. North's screenplay was informed by other science fiction tales. The script was completed by Aug. 8, 1950 and a memo from by Darryl F. Zanuck on the 10th suggested revisions, including a title change. "Has the title The Man from Mars been used?" "That was a short story by Harry Bates. It had the basic idea of a spaceship landing in Washington and the man aboard getting out. But then the story also had strange animals – gorillas and panthers and all kinds of things – that I really couldn't use in my script. So I had to start pretty much from scratch to develop a set of characters and a story. By the time I finished the script the Korean war had broken out. Julian Blaustein, the producer, and I went in for our final conference with the Zanuck with fear and a great deal of trepidation (that it would scuttle the project)." In America's Film Legacy: The Authoritative Guide to the Landmark Movies in the National Film Registry, Daniel Eagan wrote that Julian Blaustein was inspired by newspaper stories about the negative reception to the efforts of the United Nations to promote peace. "He knew a science-fiction framework could disguise didactic intentions, and had Fox readers search for a story he could adapt to these purposes. 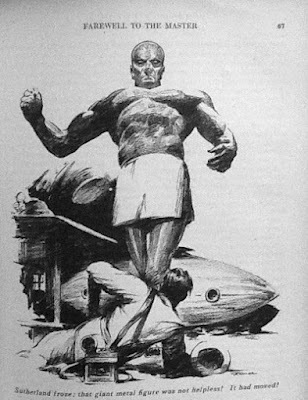 In interviews he claimed to have read over two hundred stories and scripts before settling on "Farewell to the Master," a pulp story by Harry Bates published in the October 1940 issue of Astounding Stories magazine. Blaustein assigned a screenwriter Edmund H. North to the project, specifying changes in the plot and fleshing out the characters with the author." While searching for story material, they seem to have drawn heavily on The Green Man by Harold Sherman. Numar was a peaceful messianistic messenger who came to Earth in a spaceship, and he had the power to make our technology stand still. For the key motivation in the plot, they turned to Doar's "The Outer Limit," for an ultimatum from an interplanetary force policing space and eliminating worlds that threaten the peace. "We know from scientific observation that you have discovered a rudimentary kind of atomic energy. We also know that you are experimenting with rockets... in the hands of your people-- We've observed your aggressive tendencies, and we don't trust you with such power...So long as you were limited to fighting among yourselves -- with your primitive tanks and planes -- we were unconcerned. But soon you will apply atomic energy to space ships -- and then you become a threat to the peace and security of other planets. That, of course, we cannot tolerate." Peace through gunboat diplomacy in our time. "We have an organization for the mutual protection of all planets -- and for the complete elimination of aggression. A sort of United Nations on the Planetary level... The test of any such higher authority, of course, is the police force that supports it... (We) patrol the planets -- in space ships like this one -- and preserve the peace... It is no concern of ours how you run your own planet -- but if you threaten to extend your violence, this Earth of yours will be reduced to a burned-out cinder... live in peace, or pursue your present course and face obliteration. We shall be waiting for your answer. The decision rests with you." In "The Outer Limit," we're told the Earth would be "a roaring ball of flame," if atomic bombs were used again. Imitation is the sincerest form of flattery, they say. Klaatu, in turn, would inspire others. Xeglon may have begat Klaatu, and Klaatu begat Orthon, and Orthon begat the Stranger from Venus. 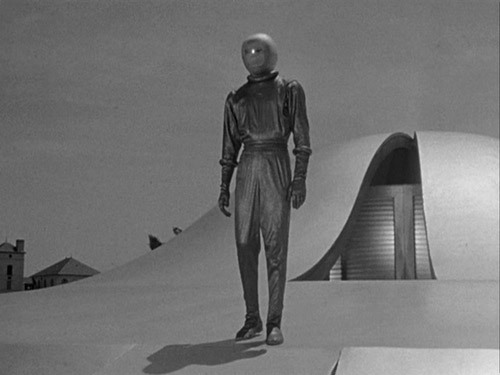 George Adamski's book partner had his own version of Klaatu from The Day the Earth Stood Still in Stranger from Venus, a 1954 low-budget movie known in the the US as Immediate Disaster. In Keep Watching the Skies! 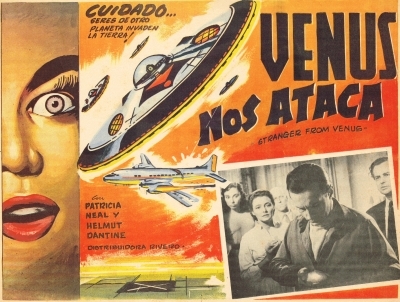 : American Science Fiction Movies of the Fifties, Bill Warren says, "The Stranger is the advance man for the Venusians, who fear we are going to get out of hand with our use of atomic power and that we will blast our planet out of its orbit, which would upset the balance of the solar system." Or, as Orthon might say, "Boom!" In the 1951 adaptation for the TV series Out There, the abducted pilot was named Peter Graves. in this movie, the hero is played by actor Peter Graves. 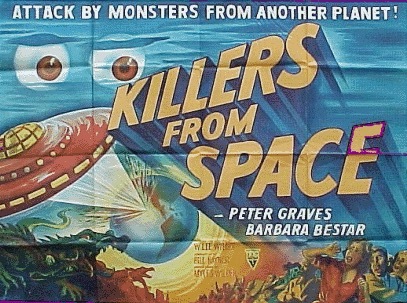 The 1954 film, Killers from Space, has some very strong similarities to Doar's story, but lacks the central idea of the aliens delivering an ultimatum. It's not an adaptation, but it's certainly possible it "inspired" it. Here, it's just some space invaders with a plan to conquer using atomically-mutated giant critters. It does, however, feature a more complete model for the typical alien abduction scenario, including a mysterious medical procedure that leaves an unexplained scar. "There is nothing wrong with your television set. Do not attempt to adjust the picture. We are controlling transmission... You are about to experience the awe and mystery which reaches from the inner mind to – The Outer Limits." There may even be an echo of "The Outer Limit" in Carl Sagan's1985 book and 1997 movie, Contact. There is no physical evidence of either alien encounter, but there's a puzzle. In Doar's story it's the return of the ship hours after it should have run out of fuel. In Contact, despite what the occupant(s) of the interstellar experiences, the device seems to go nowhere. However, the video cassette that was supposed to document the encounter inexplicably recorded 18 hours of static. Art Imitates Life, Life Imitates Art, and Hollywood Imitates Anything. The ultimate UFO movie in many people's' minds is Steven Spielberg's Close Encounters of the Third Kind. The movie presents a fictionalized potpourri of UFO history and folklore in a dramatic setting that culminates with the arrival of the "mothership" that seems to prove everything, while still remaining enigmatic. 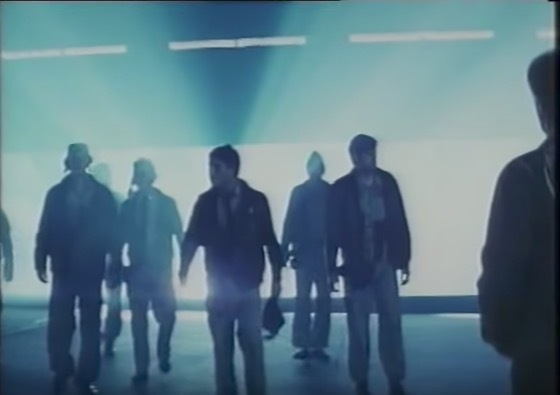 In CE3K, the first to emerge from the mothership are the abducted pilots. CE3K does not appear to draw directly from "The Outer Limit," but there's a connection ,even if it's a distant one. At the Devil's Tower scene at the end of the film, many abductees are returned to Earth, some missing for decades, but all apparently back as young as the day they were taken. Some of the returned were were military pilots, who had mysteriously vanished while in flight. Doar's story didn't feature a mothership, but the extraterrestrial craft was huge, big enough to swallow the pilot's experimental jet-plane. More important was the nature of the aliens, who in Doar's story "seemed friendly, even gentle," which is exactly the message of Spielberg's film. "This is Eros, a space soldier from a planet of your galaxy...  We do not want to conquer your planet. Only save it. We could have destroyed it long ago, if that had been our aim. Our principal purpose is friendly. I admit, we have had to take certain means which you might refer to as criminal, but that is because of your big guns which have destroyed some of our representatives. If you persist in denying us our landings,  then we must only accept that you do not want us on friendly terms. We then have no alternative but to destroy you before you destroy us. With your ancient, juvenile minds, you have developed explosives too fast for your minds to conceive what you were doing. You are on the verge of destroying the entire universe. We are part of that universe." "First was your firecracker, a harmless explosive. Then your hand grenade. They began to kill your own people a few at a time. Then the bomb, then a larger bomb. Many people are killed at one time. Then your scientists stumbled upon the atom bomb. Split the atom. Then the hydrogen bomb, where you actually explode the air itself. Now you will make a bomb that  brings the destruction of the entire universe, served by our sun. The only explosion left is the solaronite." Despite the aliens' ultimately peaceful intentions, their plan fails, and their ship is destroyed. The universe is left in danger that Earth will develop and use the solaronite bomb. 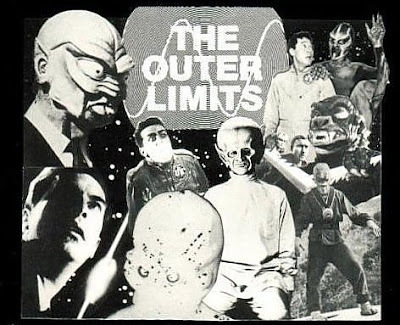 Graham Doar's "The Outer Limit "penetrated the public's consciousness early on, and will continue to echo throughout popular culture and ufology, now and into the future. As Criswell said, "God help us... in the future." Patrolship, SJ23, Galactic Guard, Sector K, reporting.... Pursuant to instructions, from the Central Council: Planet 3, Star 5, Galaxy C, Sector K has been placed under absolute quarantine. Notification to inhabitants made. Mission accomplished. XEGLON, Commanding. UFO.it, an Italian site, has an excellent article on the film. Wow. 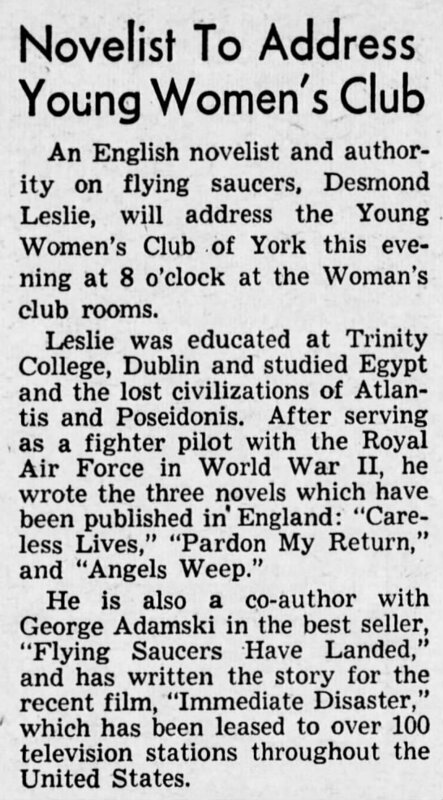 Thank you for this fascinating look at the development of many of today’s basic UFO memes, which grew out of a fictional story, The Outer Limit, that appeared in the Saturday Evening Post in 1949. It illustrates how elements of the story became established UFO beliefs as it was told and retold in several versions and a variety of media (print, radio, TV, and film) over time. This series of blog posts is a must read for anyone with an interest in the cultural and sociological aspects of Ufology. Have you guys noticed that The Outer Limit plot bears a slight passing resemblance to the Mantell case, which in real life ended tragically for the pilot? Actually if you look at some of the other posts, you can see that the elements that make up this story appeared earlier, this is the tale that bought them together and created a coherent compelling story, that resonated and spread. 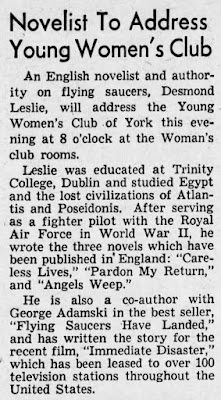 I'm glad to see that the author bought up Contact, as it is one of several stories that rely on the idea of an inexplicable time discrepancy as the key piece of evidence, there is a later short story called Control Somnambule from 1962 which sets up some of the ideas used in 1980s/90s abduction lore where the key piece of evidence, as in contact is a recording device that recorded more the passage of more time than events seemed to allow for. Thanks, PG, I'm sure the Mantell case was an inspiration to the story, and I took Xeglon's report mentioning earlier attempts at contact as a vague reference to the event. Graham, I'm always fascinated by your obscure SF references. That reminds me, I was tempted to mention The Lensman series by E.E. "Doc" Smith as a template for the Council policing the galaxy, but had too many tangents to deal with already. Or that matter the more or less straight line you can draw between "The Whisperer in Darkness" by H.P. Lovecraft and claims that there is a 'secret treaty' between the US Government (Never anyone else's oddly...) to allow aliens to experiment on humans.